4 Hand Carved Wood Christmas Ornaments with Santa Theme, "Happy Green Santa"
Santa Claus makes a happy appearance in green as ornaments from Bali. Wayan Cidra, from Bhakti Senang Hati, crafts and paints each albesia wood ornament by hand. The set of four ornaments hangs from golden cords. "I'm the youngest of five siblings and our parents are farmers in Gianyar. I never went to school because of my parent's financial limitations, and also because I got poliomyelitis when I was just a child and it left me with weakened knees. I wanted to help my parents in some way, so I have been crafting ornaments since I was 14 years old. I felt so proud to myself when I received my very first income. Although I'm not really happy with my physical condition, I'm happy doing ornaments and hopefully my products can make more people happy. My hobby is singing traditional Balinese songs. I'm married and we have a son and a daughter. My wife is the one who helps me in making these ornaments, which I hope makes people’s Christmas happier." 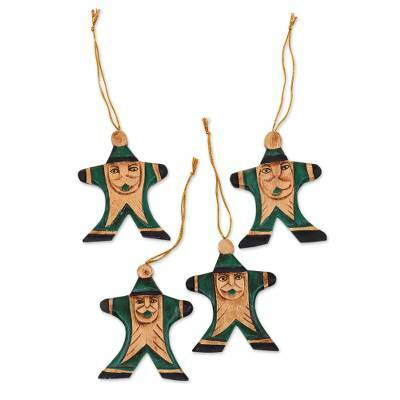 You can find wood ornaments 'Happy Green Santa' (set of 4) by Bhakti Senang Hati in holiday decor & ornaments categories such as Christmas Ornaments, Hand Painted Ornaments and Star Ornaments. Enjoy exploring these sections for other Novica treasures.